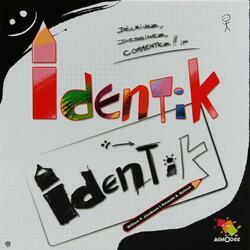 Identik is a drawing game for people who can't draw. The principle is simple: A player, the "Prime Contractor", draws a card composed of an illustration and 10 criteria. He does not look at the criteria, does not show the illustration to other players and inserts the card into a cache, only showing the illustration. The prime contractor describes the illustration in 90 seconds to the other players, then called the "draftsmen" who, at the same time, draw according to this description. Each player gives his drawing to his neighbour on the left, who becomes a corrector. The project manager discovers the 10 criteria and reads them one by one. For each criterion respected by a player, this player scores 1 point. In addition, players score 3 points if they meet the "super criterion", randomly drawn at random from the 10 criteria on the card. The prime contractor scores 1 point for each criterion respected by at least one player. The points are added together, and the player to the left of the prime contractor becomes the new prime contractor. When everyone has been the prime contractor, the player with the most points wins the game.